DestinyTracker TrueSkill is an important aspect of a Guardian's Destiny career. This thread will explain roughly how TrueSkill works and what you can do to increase your level. 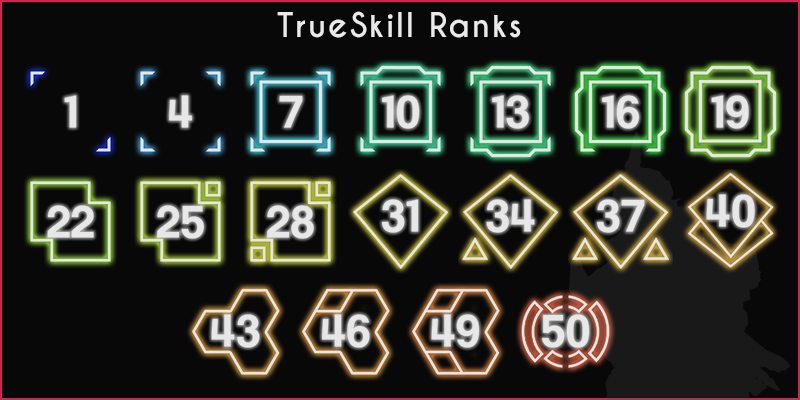 TrueSkill is an image-defined metric that appears on each playlist that a Guardian competes on that gauges that individuals performance in that mode. The range of levels begin at level one and max out at rank fifty. TrueSkill is measured by your individual performance over time (much like Site Score), but prioritizes wins above all else. TrueSkill is collection-based, that means that your rank will change only based on the statistics from your collections, it is not based on averages like Bungie's Combat Rating statistic. Players are never locked to a specific-rank and can always improve to a higher TrueSkill no matter how many games they have played in the past. Due to the nature of our formula and its calculations based on the data acquired from a Guardian's collections, it becomes difficult to grade new visitors to the site. So, in order to prevent every Guardian (even ones with hundreds of games) from beginning at a level one TrueSkill on their first visit to DestinyTracker, a second formula evaluates your existing statistics and places you based on its results. These are by no means perfect, but it helps save new members from beginning from level one. TrueSkill increases or decreases based on the stats from your collections (the games you've played between the last time you updated your stats and the newest update). This information is evaluated and points are given or taken away from your TrueSkill value. Once you pass a threshold for a specific rank, your TrueSkill will increase. As you level up, the threshold becomes more difficult to attain. Consider your TrueSkill similar to other games with ranking structures. What factors influence my TrueSkill? Winning your games is a big indication of skill level, but individual performance in your games is also considered. If you are scoring high consistently, you can expect to increase your skill level. Just make sure you keep winning your matches! We provide a TrueSkill value for each playlist that exists in the Crucible; your highest TrueSkill value will also be displayed on your player page as a sign of what you have accomplished. Why is my TrueSkill so much lower compared to my friends, but my stats are better? We usually get these questions from members who are new to the site. Remember that when you visit for the first time, we place you based on the summary of your performance thus far, so you were likely graded lower than what you are capable of playing at. As you continue to play and visit DestinyTracker, you should notice that TrueSkill value change rapidly until you reach your expected level. Yes, your level can drop if your performance does not meet the requirements of the level you are currently at. But never fear! You are never locked in to a specific TrueSkill, so improvements in your skill will always lead to an increased TrueSkill. Why am I matching this person when their TrueSkill is so much higher/lower than mine? Our TrueSkill value does not provide insight to the other players you will be matched with in the Crucible. Bungie likely uses a specific algorithm to match players that we are unaware of. If I delete my character, will my TrueSkill change? No, since TrueSkill uses stats from your collections, the number of characters you use or compete will not affect its calculation. However, deleting a character will affect your DTR score. Be aware of this before you delete your characters. What about Rumble? Do I lose TrueSkill if I don't come in first? Bungie technically considers only the top player in a match of Rumble to be considered the winner. To accommodate our free for all player base, we have a specially modified version of TrueSkill that handles the unique nature of the mode. My question doesn't appear to have an answer, what's next? If you have any questions about TrueSkill that you'd like answered, feel free to contact Darkened Night or post a reply with your question on this thread. Your feedback is important! I dont understand why my stats including true skill, k/d, win percentage and pretty much every other stat is better than some people but they are ranked higher than me in the overall crucible rankings. Does anyone know why this is the case? Maybe if you read the correct thread you'll know. hatebreedsrage said:Yeah, its essentially tailoring your score to whatever random group of people you've been paired with. I've seen some truly amazing people with crazy high scores on the losing team because they got paired with players who had 4 kills and 17 deaths. I dont see how they can call this a TrueSkill score when it has nothing to do with your skill alone. I can assure you that if someone was getting wins while going 4 and 17, they would never be able to get a 50. The same can be said for the truly amazing players who still lose, their stats can mitigate any possibility of being deranked. Think of TrueSkill like playing ranked matches on any game. Players who want to have the highest score will be playing with a team. If we didn't base our system on this, getting a 50 would be meaningless task and wouldn't offer anything to Destiny players. Hey there, recently my true skill in salvage dropped from 32 to 26 for no reason, I didn't go on a big losing streak or anything like that and it was only over a few days that it happened, has this happened to anyone else? Is there a way to fix it? Pyromadman1 said:Hey there, recently my true skill in salvage dropped from 32 to 26 for no reason, I didn't go on a big losing streak or anything like that and it was only over a few days that it happened, has this happened to anyone else? Is there a way to fix it? Your Trueskill likely dropped a huge amount due to an error in the Bungie API. I don't believe there is any way of fixing this other than you earning it again. Sorry but the fault is Bungie's! lol I went from 44 to 40 true skill and diamond 1 to silver 1 in one day. What a joke of a system. You likely dropped a huge amount due to an error in the Bungie API a few weeks ago. This was a fault out with our control but it has now been sorted. hjenx said:lol I went from 44 to 40 true skill and diamond 1 to silver 1 in one day. What a joke of a system. Perhaps this is an issue with the API, but I'm seeing that you played 46 games of Control in the past 24 hours. Your win rate for this period was 45.7%, which is relatively low for players in the TrueSkill and Elo ranges that you listed that you were at. If these games were erroneous, then there is little we can do, but if this data reflects your gameplay in the past 24 hours, then I can assure you that the system is working properly. In the pursuit of longevity and legitimacy, we have to create a system that remains difficult. I just dont agree with having wins as the main calculator for true skill, especially in ToO. I know a couple of players who are terrible, but are very fortunate to get carried to the Lighthouse multiple times a week and their true skill is 33 plus. However, if you look at other modes their DTR is at best a 20. But because they are lucky to go flawless and carry a overall k/d under .50, their crucible skill level is higher. To me this logic of scoring is terrible. Wins should count towards progression, but individual performance should count MORE than wins..... My rant is over. Thing is, it's easy to camp at the back of a map of an objective game and stat pad which would make getting a 50 too easy. That is why wins and individual performance are taken into consideration when awarding you with a rank up or not. Your kd has nothing to do with trials. Its your w/l ratio mainly.